I’ve noticed a real estate trend that bears discussion. 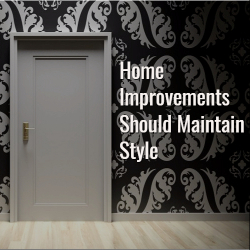 Many homeowners seem to be making improvements or additions that are incongruous with the home’s style. I see this trend in person as a Realtor, and I see the phenomenon represented in magazines, newspapers and even on television. When you buy a home, it’s natural to want to put your own stamp on it, and decorate it to your own personal taste. That’s an important part of truly making it your own. 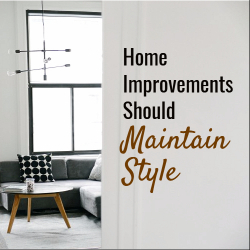 However, it’s important to take into consideration the style of your home, making improvements that are in keeping with it. This is not just for aesthetic reasons, as it can also affect resale value if the home looks disjointed or you’ve taken away the elements that made the home fit the intended style or that of the neighborhood. The most common mistake I see, especially from a curb appeal point of view, is with front-door replacement. Just because you see a door that you like, that doesn’t mean it’s the right door for your home. There was a trend here in Atlanta, which seems to be waning now, of using a door with a giant oval of fake leaded glass in the center on pretty much any style home. These cropped up on everything from mid-century ranch homes to traditional two-story brick homes, and everything in between. Taking this to a grander scale, I’ve seen folks buy a home and change the exterior to make it into a different style. A good example is someone buying a mid-century brick ranch and attempting to make it into a craftsman bungalow. Using the shutters, doors, windows and trim that belong on a craftsman home does not make aesthetic sense on a ranch home and only serves to make it look odd. If you’re considering changing the style of your home, involve an architect or designer, and ensure you have the funds, time, vision and open mind to make the appropriate changes. 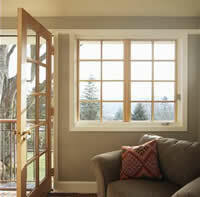 Replacement windows also can make or break the look of a home. Replacing old, single-paned windows that are in bad shape and lack energy efficiency makes sense. Unfortunately, I see too many people changing the whole look of their home by putting in new windows that are incongruous with the style of the home. Look around at the other homes in the neighborhood, especially at homes with a style and age like yours. New windows can make a home look fresh and clean, but the wrong ones will stick out like a sore thumb. In the long run, you haven’t saved money if you’ve bastardized the look and value of your home. The same logic can be applied to the interior, though there’s a bit more leeway here. It’s one thing to use traditional furniture in a modern home, or vice versa; that can work very well. The actual finishes are a different story. Overly ornate traditional moldings or staircase posts have no place in a home with a modern interior, just as sleek glass and steel trim doesn’t work with a very traditional home. There are of course exceptions and, again, an architect or designer can help you identify those special cases. The long and short of this: Try not to make a square peg fit in a round hole. If you like prairie style, you should try to buy a prairie style home. If you like sleek modern design, go for a home that fits your aesthetic. Trying to change the home or its key elements to a totally different style is really not an improvement at all. Save your time and money, and protect your home’s value. It takes a lot of effort to transform a boring space into the phenomenally designed and functional interior. Unfortunately, not everyone can afford an interior designer who will enter their home and reverse the appearance of the apartment. Some of us secretly want to be creative, to design, using our own individual style and preferences. But this too requires a certain amount of talent. Still, when it comes to styling a home space there’s no room for desperation because there are always some helpful staging tips that can help everyone in need of good advice on how to make the home look as good as possible. Keep in mind that your goal is not to deceive potential buyer, but to give them a real feel of how the property can look after they invest some money in design and remodeling. Backyard fence or railing of the balcony and the terrace is one of the first things your potential buyers will see. The first impression they get before they even enter the house is very important. In fact, a new color scheme on the fence will give the impression that your home is well maintained, and visually will surely look better. Also, do not neglect the front steps and front door – they must not be squeaky, loose, worn, etc. Sometimes, a bit of sanding and a few cans of paint will be sufficient to bring everything in order and leave a better impression. By all means clean the garden, plant flowers, mow the lawn, style the plants. Beautifully landscaped courtyard will certainly leave a better overall impression, and will provide a higher real estate price. The same applies to balcony (terrace). Clean it up, put the pots with flowers, chairs and a table. Carefully placed furniture and pots can cover any disadvantages. Or, if nothing else, clean the exterior well and leave it plain. The sale of empty house or apartment can prove to be a bad move. After emptying the space that was formerly furnished, and removing the pictures and other decor, you are left with bare walls that can reveal many shortcomings. If at all possible, sell the home while it is still furnished. In addition, chances are that customers may want to keep some of the existing furniture, which is very good, if you do not plan to carry it with you. Clean up the garage, basement, attic, but also the regular living space of any clutter. Take out the things that are no longer in use, and are only making a mess. If your furniture is worn out, cover it with blankets, an old table with tablecloth, and chairs with decorative pillows. Another option is to get rid of furniture that really deface space. It does not matter whether the tiles and flooring are new or old, broken or worn, you should polish them to make them look clean and tidy. If the tile joints are full of mildew, obtain a means for removing mold or re-grout the tiles with only slight surface layer. Your tiles will immediately look newer and brighter. Paint the walls, especially if you sell a house or apartment that is already empty. Paint the house in a neutral color, white, beige or yellow, because that way you will create an even greater sense of space and light. You will create the impression that this is a new landscaped area. If the walls are covered with wallpaper, especially those old and worn, remove them and paint the walls in a neutral color. Wallpaper is very closely related to individual taste and not everybody likes them. Old, tattered and worn kitchen can look new again, if you paint it over with white, beige, chocolate brown, gray or other creamy color. Of course, it depends on how much effort you are willing to invest in real estate sales, but surely that seemingly well-kept kitchen with fresh paint and polished appliances is pleasant on the eye, which can be critical when selling and purchasing a real estate. Interesting and striking doors will always provide an entirely different ‘tone’ of any room. Your home can change a lot thanks to the doors that represent the beginning of every story. From futuristic look to vintage era, your doors can create a completely new feel of the whole house. Interior designers who work for interior magazines and TV shows have learned to create such interiors based on their experience and rules which they apply in decorating. Each designer develops his own style and leaves that personal touch. However, designer tricks are not difficult to learn and incorporate into your space. It is certain that you cannot develop your own style on the basis of one project, but you can have a home from the magazine. Look through magazines, ask for advice from professional interior designers, consult the web to get some ideas on this topic, find some great suggestions for doors at Furniture Down Under, take a walk through a furniture store, look at different pictures and let yourself become inspired. No one doubts that you know how to style your own home, but sometimes it is necessary to listen to the advice of experts. Then all that is left to do is to fit your own capabilities with the proposals of those who do this professionally. Staging your home so that it looks attractive to potential home buyers can add thousands of dollars to the final sale price of your home. When people think of preparing for a home tour, they often think of de-cluttering and cleaning, but staging is more than that. It’s really about making your home an inviting and welcoming place by preparing its interior and exterior so potential buyers can envision their lives in it. Though you can get great results and end up making more money when you use a professional stager, it’s understandable that some buyers want to save a buck or two. Here are five DIY tips for anyone looking to stage their home themselves. 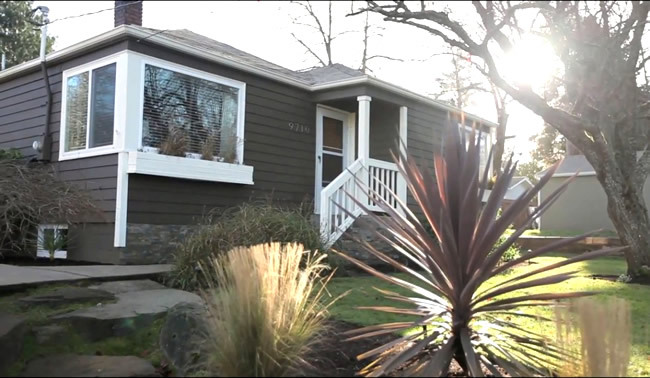 The exterior of your house, often described as your home’s curb appeal, provides the first impression for any buyer. Make sure buyers feel welcomed by mowing and raking your lawn, trimming your shrubs and bushes, and sweeping your driveway and walkway to tidy everything up. Buyers want to envision themselves in their new home, and if they’re distracted with the details of someone else’s life, it can really detract from the home tour. Remove photographs, general clutter, and distinctive style elements like doll collections or an avant-garde sculpture. Once you’ve made the space more neutral, attack dust bunnies and grime with a vengeance. Steam clean your carpets, pressure wash patios, and scrub the bathroom grout. Cleaning your home can really enhance buyer perception. You’ll want to remove all but a few key pieces of furniture, and preferably those that really define your space. In a living room, that’s probably a couch, a coffee table and two comfortable chairs. In a bedroom, it might be a bed and a bedside table and not much else. It sounds obvious, but make sure the furniture is spotless too. Spot a stained cushion? Turn it over or artfully drape a blanket to conceal it. Kitchens and bathrooms really sell your home. Because these spaces are sometimes more intimate, make sure they are especially clean and well lit. 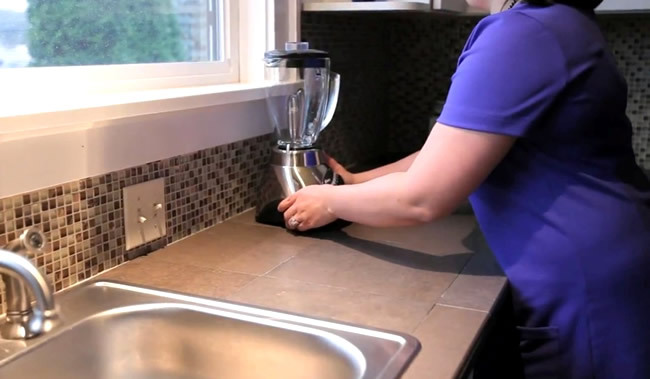 Move most appliances out of view in your kitchen, leaving one or two out like a blender or a polished toaster. In the bathroom, add a single dish of soap. 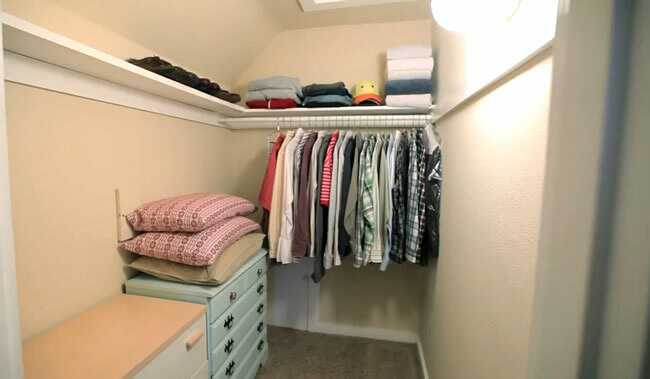 Buyers love storage, so do what you can to emphasize the space in your closets. Remove half the clothes and make sure you can see all the way into the back. Space hangers evenly, match shoes, and make sure everything is generally tidy. Taking the time to stage your home can make a big difference when people start touring. 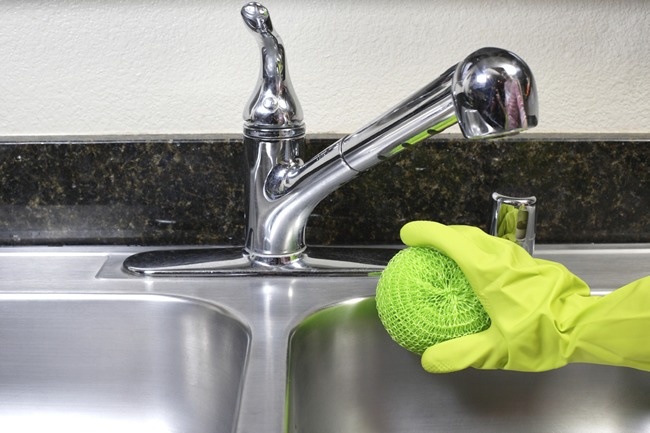 You may be tempted to go above and beyond, but do your best to keep things clean and simple. When buyers can imagine living life in your home, they’ll be that much closer to making an offer. So you want to sell your house. You will need to make your home more appealing than others on the market. Staging will accomplish this goal. Staging your home will result in a faster sale and result in a sale for more money. 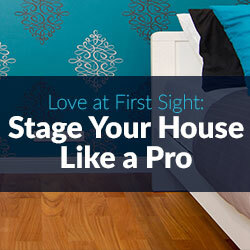 Before you stage your home you need to know a few things about staging. Staging is in fact the opposite of Decorating. When an interior designer comes to your home they are personalizing the space for you. They are designing an interior specific to the inhabitants. Staging is a process where the idea is to edit the interior and showcase the house. This is different than decorating because many of the items in your home will be removed. Paint colors will be simplified, furniture and accessories removed etc. so that the home will have the broadest appeal possible. The way you live in your home and the way you sell your house are 2 different things. In our day to day lives we leave many things out for easy access, we don’t always replace burnt light bulbs and use all the lights in the house. The mail is left on the counter, medications in the bathroom. etc. When it is time to show your home to potential buyers, it is also time to put all these things away. Clear the kitchen counters. Put the toaster and the coffee maker in the cabinet. Take care of maintenance issues. You will want to do this because buyers have (as is the case with most people) difficulty envisioning the potential that a home has. If they are distracted by your belongings they will have a hard time imagining living in the house with their things. The better your house shows the faster it will sell. Now is not the time to stop spending money on your house. Many people think they are putting their house for sale and are therefore are not going to put another dollar into it. When you are staging your home for sale you are investing in your biggest asset and earning back your equity. If for instance you spend money to buy new kitchen appliances for hundreds of dollars and sell your home for thousands of dollars more you can see that it is worth it. RODERICK’S TIP! – If your kitchen or Master Bath are in need of remodel. Consider doing the remodel. Potential Buyers often reject a house if they know they will have to spend money on big ticket remodel projects. Ask your Realtor, they will likely tell you that you will recover or actually make profit on this type of remodel. Now you are ready to stage. Help the buyer to see the “ house” not “your stuff” Remember we are helping a buyer to see a blank slate where they can imagine themselves living. So you will need to …Clean everything , Eliminate clutter and start packing. Ever walk into a home and notice the dirty carpet or cleanliness of the kitchen? It’s often a clue to the cleanliness and maintenance of the entire house. Clean houses are more appealing. They look better and buyer will assume that your house is well cared for. The inside and outside of your tub. RODERICK’S TIP ! – Pay special attention to anything someone might touch. Nothing is worse than a sticky doorknob or filthy light switch. You may have become accustomed to the smells in your home so have a good friend come over and give you honest input about what people can smell when they come into your house. If you have pets, mold, old carpeting, have a smoker in your house or enjoy cooking pungent foods these smells must be eliminated. It is best to find the source of the smells and permanently eliminate it rather than trying to disguise the smell. RODERICK’S TIP! – When staging your home, put an air freshener near the front door so potential buyers have a good first impression. Spaces seem to have their own energy. A buyer will stand at an entryway and feel the energy of a room. They won’t want to go into a room with too much clutter because the energy is scattered. We want the potential buyer to be able to picture adding “their” character to the home. So in staging we will eliminate pictures of your family, small accessories, to many pictures on the walls, area rugs and many of your pieces of furniture. RODERICK’s TIP! – If you are having trouble deciding if a particular object or piece of furniture should be eliminated, the answer is eliminate it. Less is usually better. Most people have too much furniture. This is fine for living but not for selling. While staging, remove a few of the biggest pieces of furniture from your home. Chairs- Dining rooms usually have too many chairs. Also take the leaf out of you table to make it smaller. See if you can eliminate chairs from every room it will open up much space. Accent tables, book shelves, clocks, area rugs, chests can all be packed away and removed from the home. Eliminate many pieces of outdoor furniture, especially anything that is dirty or in disrepair. Tools like shovels, buckets, watering cans etc. RODERICK’S TIP! – Remember you are setting a stage, you are arranging your home for maximum affect. So outside, make comfortable seat in a shady place. Place a book with a bookmark on a table bedside it. Potential buyers will see this and automatically picture themselves there. You win the battle to sell your home when the potential buyer starts to imagine themselves in your house. Start packing before you list your house for sale and Where do I put all my stuff? You are moving anyway so why not start to pack the items that make clutter. Where will i put all my stuff now that it is out of the house? Give it away (most of the items you have, were bought for this house. Those possessions never really seem to fit or harmonize correctly in another house. So donate it and start over in your new home. Rent a storage unit or a pod. RODERICKS TIP! – Most people who put things in a storage unit never take them out. So consider that this is an expense you may not want. These tips will get you well on your way to staging your home and selling your home successfully. Don’t feel like the job is to big. Most of these are things you will have to do when you sell your home anyway. You have just made moving a little easier! Now, when you move into your new home you will again be able to fill your home with the things that make it personal. You might consider the help of an interior designer before you move in. An interior designer will be able to help you find the best places for your furniture and help you to make your new house into your “home”! RODERICK’s TIP! – When you are “showing the house” Air out the house by opening windows a couple hours before people arrive, turn on some low volume music, turn on all the house lights. Bake cookies so that the house smells like home. Certificate of Occupancy: What is it and who needs it?